It's one of many displays that will help Google Assistant become more interactive and visual. Lenovo’s Smart Display puts Google Assistant on 8- and 10-inch touchscreens. The result is a smart-home sidekick that adds a visual element to all the rich A.I. features we’ve already seen in the Google Home smart speaker. Announced Monday night at CES and due to ship around July, it’s still too early to see how well Lenovo’s Smart DIsplays will compare to Amazon’s Echo Show (which earned high marks in our TechHive review). The hypervigilant Google product managers who orchestrated our briefing carefully focused the demo around what the Smart Displays could already do well, and shied away from features where the kinks were still being worked out. In short, I was allowed to try only specific, pre-vetted tasks (more on my experiences below). 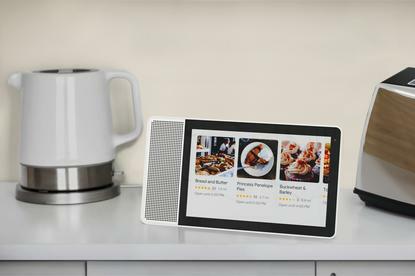 The Lenovo Smart Displays already look better than Amazon’s Echo Show offering in terms of pricing. The company will charge $200 for the 8-inch version and $250 for the 10-inch version. The single 7-inch Echo Show, meanwhile, costs $230. Here’s a closer look at the features on the displays. Lenovo’s Smart Display comes in 8-inch and 10-inch sizes that can sit horizontally or vertically. The displays are rectangular with the speaker on one side. They can be oriented vertically or horizontally, although only horizontal worked during our demo. The frames are gray plastic, but the backs were finished in a light bamboo veneer that gave them a bit of warmth. I’’m not going to wade into the Amazon Echo vs. Google Home debate, as our authority Michael Brown at TechHive has ably done so, and I’ve had limited experience with Google Assistant and none with Amazon Alexa. 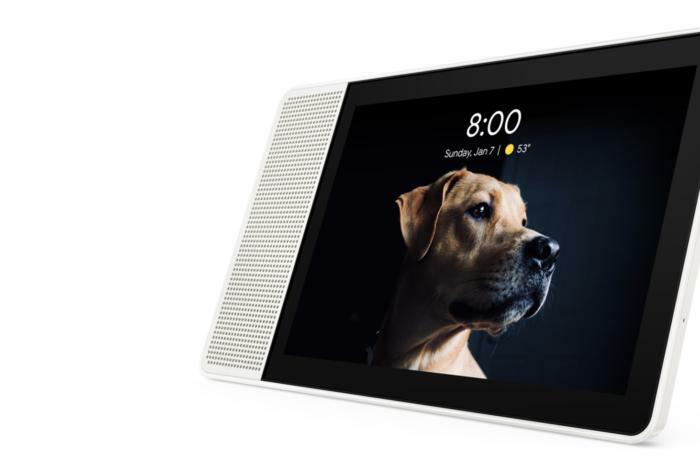 But after talking to Lenovo’s Smart Display (under the careful watch of its Google minder), I can see how this device could slide into my life. The home display on the demo unit showed a personal photo as the default wallpaper, plus the time. All I had to do to get more was say “Hey Google” and ask for somethnig like the weather, traffic, or restaurant suggestions, among other choices. Google Assistant would deliver with visual icons that I could slide or touch to select. It even played a game—Google’s own “I Feel Lucky” trivia contest—in hopes it would come in handy if I felt bored or needed a break. 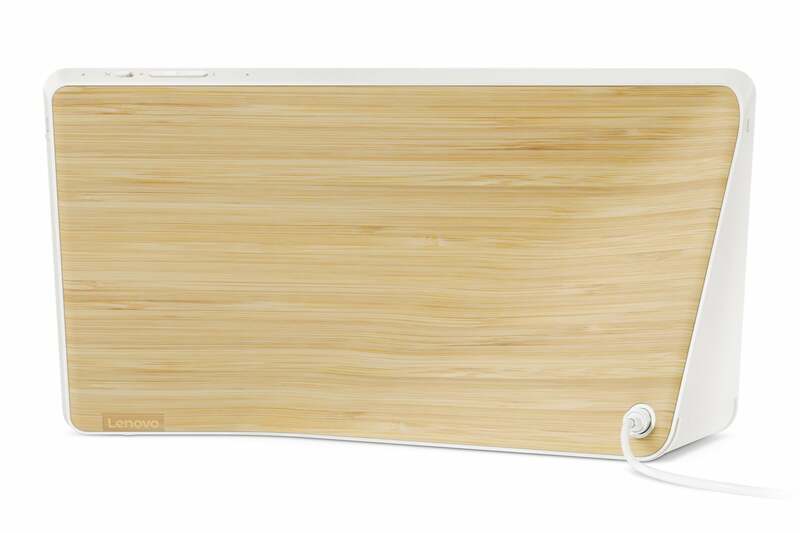 A light bamboo veneer on the back of Lenovo’s Smart Display help it look more homey. Obviously, these smart displays deliver the most when they can tap into Google services, encouraging you to commit to their ecosystem. Google Maps, Google Play Music, Google Photos, and YouTube all figure prominently in the information delivered to you. And you can use Google Duo for video chats with people who also use Google Duo. The displays can also integrate into a variety of smart home systems, providing controls for devices like smart thermostats and security cameras. A new feature we previewed is called Routines. It lets you customize information you want from the display based on a predictable part of your day. For instance, you could say “Hey Google, good morning,” and the display would know to give you granular traffic information for your commute direction—along with other details that aren’t currently built into Assistant’s “what’s my day look like” prompt. Given how heavily scheduled people can be these days, I’ll be interested to see how detailed Routines can get. Google’s not messing around in its face-off with Amazon Echo. Lenovo is one of many partners expected to announce smart displays at the show, in an apparent strategy to overwhelm Amazon with competing products. But Google had better hurry up. If these displays are still six months or more away, that’s six months that Amazon has to weave itself into more people’s lives before Google can get to them.